Written by health professionals: Doctor, M.D., CphT, and others - but easy to read. Cholesterol levels managed without harsh drugs. Cholesterol, heart disease and stroke. Cholesterol and Saturated fat - daily allowances and guidelines. Provide your personal numbers for analysis! Doctor isn't worried? Should you be? Easily work out your daily allowance of saturated fat, calories and much more with our special calculator. Cholesterol drugs, medications and pregnancy. Niacin or flush free niacin? Pets, Cholesterol and Cardiovascular disease. Cardiovascular disease - it's effects on the arteries, veins and capillaries. Fast weight loss and the urge to eat. Our Very Best Weight Loss Program. Donald Urquhart,(BA & DipAppPsy), Fully Registered Psychologist. A past cholesterol sufferer. Michael T. Sapko, M.D., Ph.D.,Trained as a Doctor, but preferred writing more. Excellent that he chose to write for www.CholesterolCholestrol.com too! Loni Ice, (CphT), Certified Pharmacy Technician - the one behind the counter you ask for help from with your cholesterol medication and drugs. Strong interest in healing herbs. Chris Urquhart, Student, studying for a social work degree. Has a passion for medical and veterinarian history and provides back up support. Not yet qualified to write for CholesterolCholestrol.com, but very useful indeed. Cant see all the site links? Scroll down so that the topic you are interested in is at the top of the screen and mouse over. Site appears to display best in IE, eg IE7. Screen resolution about 1200+ wide. CHOLESTEROL FAT TYPES: LDL, HDL, VLDL, Apo B and Apo A1. Let's start with the essentials first - What is cholesterol? What are the dangerous cholesterol fats and why are they dangerous for people with high cholesterol? How often should you have a cholesterol test? When you have read our essential cholesterol information and the other sections on this page, you can find more indepth cholesterol information through our links on the left - we go into things in greater detail on our other pages - but this is an excellent page to start with. There is confusion even in the medical definitions of cholesterol given by universities and doctors. It is sometimes described as fat, other times it is defined as a fat like substance, sometimes as a waxy substance. However, human cholesterol is mostly lipoprotein, and lipo is from Greek "lipos", which means fat. There are three basic cholesterol fats you need to know about. VLDL refers to Very Low Density Lipoproteins. HDL is short for High-Density Lipoprotein, LDL refers to Low-Density Lipoprotein. The HDL cholesterol is referred to as the good cholesterol, the cholesterol we want lots of, while the LDL is portrayed as the bad cholesterol, that we need to keep low. HDL cholesterol also helps to clean the LDL cholesterol out of the blood. How are the three cholesterol fats different from each other? It's a matter of size - the VLDL cholesterol is large in comparison to the medium sized LDL cholesterol or the tiny HDL cholesterol. A more medical explanation of the different types of cholesterol: VLDL cholesterol, LDL cholesterol and HDL cholesterol are all composed of cholesterol, protein, and triglycerides. They are different from each other according to the ratio of the amount of cholesterol to protein to triglyceride. LDL is high in cholesterol. HDL is high in protein. VLDL is high in triglyceride. Why does the type of the cholesterol matter so much? Why is the HDL cholesterol referred to as the good cholesterol? Why is LDL cholesterol referred to as the bad cholesterol? LDL, HDL and VLDL actually refer to water soluable lipid protein chains that carry cholesterol around the body. Cholesterol is not water soluable, and will not circulate easily in the blood stream. In fact, cholesterol will drop out of the blood and onto vein and artery walls really fast. To overcome this, the body builds the lipid protein chains to carry the cholesterol. Much the same as we build boats to traverse water. Well, the HDL lipid protein chains are molecules that run round the blood system picking up cholesterol off vein and artery walls that it finds. When the lipid protein chain has collected the cholesterol, it is referred to as " HDL cholesterol". HDL cholesterol is then jettisoned from the body tissues, it's size tells us it is earmarked so that the liver will eliminate this type of cholesterol from the body or convert it to bile. As HDL cholesterol will not be left to build up on arteries and so on and represents cholesterol being eliminated from the body, it is referred to as good cholesterol. Bad LDL cholesterol on the other hand is cholesterol ear marked for cell use and is carried by LDL lipid protein chains. LDL cholesterol is the necessary cholesterol moving through the blood stream to allow the body's cells to take as much cholesterol as they require for normal functioning. When there is too much bad LDL cholesterol in the blood, there is way too much for the cells to use, the bad LDL cholesterol remains in the blood, but while it is waiting to be used, it may deposit onto artery walls and so on where it then becomes a health hazard increasing the risk of cardiovascular accidents - for this reason, this necessary cholesterol is referred to as the bad cholesterol, even though, in moderation, it is beneficial to us. There is another cholesterol that has been identified as a bad cholesterol and that is Lp(a) cholesterol. Lp(a) is a type of LDL cholesterol and has been found to be linked to cardiovascular disease. This particular type of LDL cholesterol is apparently easily controlled by vitamin C. See our page on the cholesterol myth to learn more about this particular type of LDL cholesterol. VLDL cholesterol, the high triglyceride cholesterol, is also considered a bad cholesterol. The main role of VLDL cholesterol is to act as a storage device for excess calories that cannot be used straight away. When the excess calories are converted to VLDL cholesterol, the VLDL cholesterol is then taken up by the fat cells. When there is more VLDL cholesterol circulating in the blood than the fat cells can immediately take out, it becomes a problem for the cardiovascular system, in much the same way as LDL cholesterol does. Are there any other cholesterol fats related to cardiovascular and heart disease? Since writing the above on the diferent types of cholesterol fats, several other blood and cholesterol types have been found that originally appeared a bit better at determining your chance of a cardiovascular accident, but other research has not confirmed this, but found instead that the measures were not all that good. Apo B is thought to be the really bad part of LDL cholesterol, while Apo A1 is the thought to be the really good part of HDL cholesterol. Essentially, the essence of the bad and good cholesterol respectively. Both Apo B and Apo A1 can exist in your blood independently of hdl and ldl cholesterol. The ratio of Apo B to Apo A1 is apparently 50% better at determining your risk of stroke and so on, when compared to the usual cholesterol measures / tests, but as stated above, this finding is open and not confirmed. In case your wondering, the usual cholesterol tests are able to predict 33% of cardiovascular hospitalizations. When should blood cholesterol fats be checked? If you are over 20 years of age, it is recommended that you have both your HDL good cholesterol fats and LDL bad cholesterol fats checked every five years, along with your triglyceride level - most triglycerides are VLDL cholesterol fats. In Australia the medical guideline is to do regular cholesterol checks from age 20 years, if there is a genetic history of young relatives dieing from heart attack and stroke. Otherwise, the guideline is for regular cholestrol tests to begin at age 40 years. The actual cholesterol fat levels considered normal or beneficial have been changing over the years, so it is best to check with a doctor about whether your particular cholesterol levels are high or not, but we have included an ALL ABOUT CHOLESTEROL LEVELS WEB PAGE to assist you. Don't want to risk the side effects of harsh medications? Lipi-Rite may be what you want. 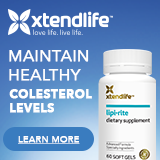 Remember, www.CholesterolCholestrol.com is crammed packed with useful and beneficial information for lowering high cholesterol naturally through a cholesterol diet, and much, much more.